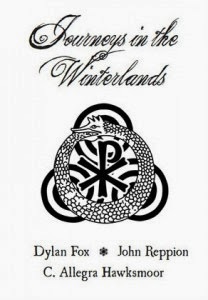 Dylan Fox, C. Allegra Hawksmoor and John Reppion, Journeys in the Winterlands. Vagrants Among Ruins, 2013. Pp. 52. ISBN 978-0-9574872-0-8. £2.00 (digital)/£4.00 (print). Journeys in the Winterlands are three connected short stories that take place in a post-steampunk wintery apocalypse, or, as it’s been described, a “snowpocalypse.” Living in Montréal and in the middle of an intense cold snap, I couldn’t resist reading and reviewing such a book. I was not disappointed. Although the book felt a little incomplete, and at times and seemed to be missing connections, it is amazingly rich in world-building, atmosphere and character development. This is a particularly impressive achievement for a book of its brevity. Another challenge for this writing project is the fact that it’s a collaboration between three different writers. As co-author Dylan Fox remarked, the aim was to “make something greater than the sum of us as individuals.” The question is whether they succeeded, and if so, what that something is. The backstory presented is that nine years ago, on All Souls Day, a new star appeared in the sky. Then the star disappeared, leaving a cold, frozen world and a permanent aurora borealis that can drive humans mad. People who were driven insane by looking at the sky are called the “Affected” and have built monstrous half-human, half machine creatures that butcher unaffected humans. Or something like that. There are a few things I’m not clear on—like whether it was the new star that drove people mad or the aurora borealis. I am also not sure whether the Affected or their creations or both are the ones killing and/or eating the human survivors of this apocalypse. I admit that it would be satisfying to know the answers to these questions. On the other hand, not knowing for sure doesn’t prevent the reader from appreciating the stories. In the first of the three tales we meet Callista. It is clear from the start that she is a born survivor, fierce and smart and strong. She is traveling through the winter wastelands, hiding from the Affected and their twisted cities and searching for her mentor, Edward O’Malley, also known as “the web of the north.” What she finds instead is an underground factory where Santiago, an artist, is living, seemingly alone, as he works on a complex series of murals while surviving on mutant mushrooms. Although they are mutually distrustful of one another, Callista and Santiago eventually relax to the wonder of being in contact with another living human being. Then certain troubling truths come to light. As troubling as these truths are, the second story is far more disturbing. This tale’s main character is Josiah Morgan. In earlier days, he was a scientist and a father. Like the first story, the narrative is third person omniscient, but the perspective feels more like first person: intimate, almost suffocating, which adds to the horror of it. We learn about Josiah’s role in trying to prevent, or at least mitigate, humanity’s slide towards disaster. Because of the conclusions he reached—brutally honest, cynical and devoid of idealistic hope—he was deemed a madman. Serpentine characters twist and coil and overlap, their meanings known only to him. We see Josiah now trapped in some kind of loop of insanity and despair, scraping at an encrusted wall with an overgrown fingernail, trying to solve the same problem again and again, before sleeping in the frozen slush. It’s like an internal apocalypse of the mind. In the third story, we are once again treated to our hero Callista who has found her mentor, Edward O’Malley. After being captured and tortured and displayed by the Affected, he is not the same person he once was. It is interesting to see these two characters interact after having earlier observed how Callista behaved with Santiago. It is also interesting to wonder about the changed O’Malley. Callista thinks his trials have weakened him, but perhaps he is wiser. He poses questions about what exactly is a human being and, unlike before, he has no sure answers. We are rooting for both of them as they fight to find a path of hope in a harsh world almost empty of life. Behind it came the harvest engine: spiked wheels rotating slowly beneath the furiously pumping pistons and exhausts that made the blizzard shimmer with heat… The sky rolled purple and blue and charcoal-black over the pipework city, the colours bleeding into one another like ink running into water. The wind came from the west, screaming like an animal and ripping up the ash and snow into a bow wave. Clinging to the northern horizon, thin membranes of blue-green light stretched and rippled and expanded over the marbled sky in a dance of colour and movement that seemed to possess some sort of consciousness of its own. In contrast, the characters of Callista and O’Malley are familiar and solidly human, grounding a story that might otherwise be too ethereal for certain readers. The “activist-inspired” aspect of this book is quietly omnipresent, both below the surface and woven throughout the writing. There is the environmental message, as we learn about pipes that drove through the ice “…into the crust of the planet beneath, sucking the last dregs of life out of the mantle of the Earth.” The snowpocalypse itself is reminiscent of nuclear winter, climate change, and a host of other possible dire consequences to humanity’s thoughtless use of resources without regard to future generations. Yet the story is not anti-science, anti-knowledge or anti-technology. “Knowledge is like blood,” O’Malley says towards the end of the third story. “If it’s not moving, it’s dead.” The book’s take on these issues seems more an unsentimental look at the use of technology in a society where the wealthy and powerful exploit and thrive at the expense of the poor who struggle and die. It is not technology or science that is to blame but rather humanity’s shortsightedness in destroying everything in it’s path, like a dragon serpent devouring its own tail, an image mentioned in the second story and featured on the book’s cover. The politics of the book are also expressed in the portrayal of a strong female lead character. She is smart and she is a fighter. Unlike what we often see in literature featuring tough women, Callista is not a victim or damaged—at least no more so than anyone else who’s lived through an apocalypse. Likewise, the fact that Santiago had a male lover isn’t served up to satisfy a stereotype and doesn’t feel like mere tokenism. It’s just so in the same way that Callista happens to be a women rather than a man. An anti-religious tyranny message is also suggested. There is the fact that looking towards the heavens has the effect of driving people mad. Added to this is the less subtle image of O’Malley in the third story killing the insane religious leader. Journeys in the Winterlands is an experiment in collective storytelling, taking place in the same universe as the White is the Color of Death collection put out by Combustion Books. I have not read any of that collection so I approached Journeys in the Winterlands as self-contained. As such, my main criticism is that while reading Journeys, I kept feeling as though something were missing. For example, I did not have a sense of how much time had passed between the first story where we meet Callista and the last when she has found her mentor, O’Malley. I not only wanted to know what had happened to her since meeting Santiago but I felt that it was important that I know. Even while reading the first story, I felt that I had missed something. Why was Callista suddenly referring to Santiago as “Santi,” as though they had been friends for years? Likewise, when I read the second story, I kept trying to fit it in with the first one, wondering if Josiah Morgan was someone I had already met in that tale. This nagging sense of incompleteness or missing pieces persisted through the end of the book, although I had the sense that a second careful reading of all three stories would cause certain elements to come together better. At the same time, I was extremely impressed by how well the three stories meshed in terms of writing styles and approaches. I even wondered at some point if the writers wrote all three stories together rather than each writing their own separate story. Besides a common ambience and perspective to the stories, all three tales contain beautiful, rich language combined with a lack of self-consciousness in the writing that was refreshing. All of my senses were engaged while I read of a world that was stark and lonely, dark and horrifying. Yet, the reader is also left with a feeling of hope that humanity might still have a chance with heroes like Callista and Edward and, in his own way, Santiago. Journeys in the Winterlands is published as a chapbook with a beautiful inked title and cover art. This presentation adds to the feeling that the reader has acquired something unique and lovely. Maybe the fact that it seems incomplete can be viewed as an invitation to contribute through our own imagination as we journey in the winterlands.